What is the BitShares UI worker? The BitShares Blockchain supports the creation of on-chain workers that all BTS holders can vote on. A worker pays out a its defined daily BTS rate when it is voted active (see Proposed/Active tabs in the UI). The BitShares UI worker is escrowed by the BitShares Blockchain Foundation and its funding status can be viewed here. The UI worker is a prime example of a decentralized worker that requires community feedback (beauty and curse). There is no fixed team besides Bill Butler (Manager), Startail (Issue review) and Sigve (Code review, I am currently doing that in Sigve's absence). The UI worker is structured primarily over GitHub issues that are driven by the community. This allows the worker to move the UI in the exact direction the community wants it to go, with the downside of the lack of a centralized lead that enforces a roadmap (i.e. which issues must be worked on). Any developer can pick up issues and contribute which allows the worker to be very flexible. The UI worker is currently inactive. What was the critic to the worker? The UI worker needs your vote! A total of 18 issues have been resolved through integration testing, they can also be found in the release notes. 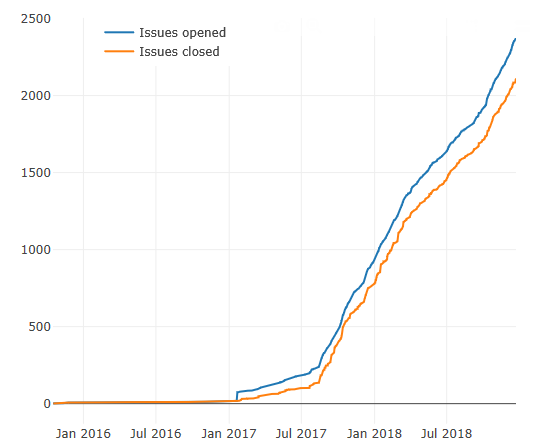 nice post..i like your post..
To visualize how much issues that have been created, addressed and closed by the team since the community started funding the worker of Bitshares-UI. We appreciate the support from the community to be able to do this work, and to continue enhancing the UI. Repository activity for the last month.